Comedian Hari Kondabolu, whose stand-up and podcasts have a socially conscious focus, is now fighting back with the documentary "The Problem With Apu," airing on truTV on Sunday at 10 p.m. EST. Growing up in New York in the 1980s, comedian Hari Kondabolu was like many young people. He watched "The Simpsons" and he adored "The Simpsons." There was just one thing that bothered him about it. Amid the fictional Springfield barflies, incompetent doctors, clowns and crazy eggheads was a truly cartoonish character — Apu, the Kwik-E-Mart clerk who sold expired food, ripped off customers and delivered the sing-songy slogan "Thank you, come again." To Kondabolu and plenty of other people of South Asian heritage, the pot-bellied, heavily accented Apu led to real world bullying, self-loathing and embarrassment. Apu was one of the only Indian immigrants portrayed in popular culture and yet he was a buffoon. "This character — the only representation that we have — led a lot of kids who were born and raised here to feel non-American," said Kondabolu. "If you don't nip racism in the bud from the beginning, it mutates and finds other ways of surviving." Kondabolu, whose stand-up and podcasts have a socially conscious focus, is now fighting back with the documentary "The Problem With Apu," airing on truTV on Sunday at 10 p.m. EST. He hopes the film is as funny as it is illuminating — an important thing if you're going to war with one of TVs most beloved animated institutions. "As a comedian, if you're going to kill joy, you better kill it with joy," he said. The documentary features interviews with other performers of South Asian heritage, including Kal Penn, Aziz Ansari, Aasif Mandvi and Hasan Minhaj, who share their own distaste for Apu. Vivek Murthy, who became surgeon general of the United States, recalls being bullied in seventh grade by a kid using Apu's accent. "It's not about him being funny. That's not the issue. He's a fundamentally flawed character, based through the lens of a stereotype. I think sometimes people confuse sometimes funny and wrong," Kondabolu said. Kondabolu grew up in the diverse New York borough of Queens and was shocked to not see on film or TV what he saw on the streets every day. The message he got was that non-whites didn't exist. He became so desperate to connect with anyone on TV that he found solace in the immigrant Balki from the sitcom "Perfect Strangers." Penn, the "Designated Survivor" star who has mocked racial stereotypes in his "Harold & Kumar" films, suspects Hollywood can get away with a lot more mocking of Asian-Americans than it can with another ethnic group. "If you had an African-American character — even a cartoon — with the types of stereotypes done for Apu, people would understandably, and very rightfully, raise hell and the studio would say, 'We can't do this. This is not funny,'" said Penn. "They would do it both because they would see it as deeply problematic and offensive but they would also say, 'This joke is played out.' That's how I see a lot of 'The Simpsons' stuff — it's played out." To those who push back and say "The Simpsons" is an equal-opportunity offender that mocks various ethnicities and cultures, Kondabolu argues that some images have lasting impact, especially if you have so few of them. "If you only have a handful of representations, each one counts more because that's the only thing you get," he said. "If you're a middle-aged white dude, you can be anything. You can be a detective, you can be the crook. You can be the president, you can be the assassin." Brown people, on the other hand, come in two options: either crafty terrorists or clerks and cab drivers. Much of "The Problem With Apu" becomes like Michael Moore's "Roger & Me" — an attempt to sit down with Hank Azaria, who's won three Emmy Awards for his work on "The Simpsons," which includes voicing Apu since the first episode in 1989. 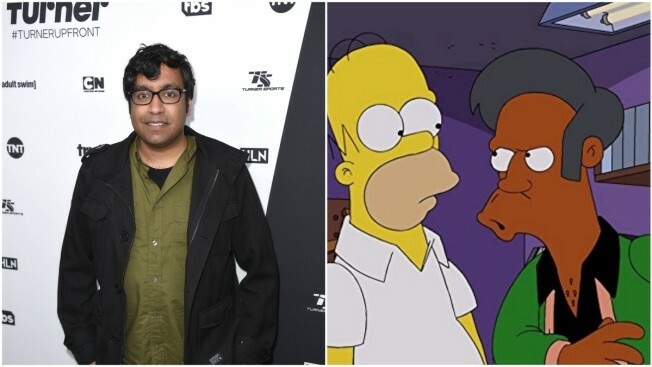 While he's no Apu fan, Kondabolu is adamant he's not looking to end "The Simpsons" or even remove Apu. "I don't see any point to killing him. What's the point in killing him? To me, it's lazy writing if they kill him. They're 'The Simpsons.' They're supposed to write their way out of it," he said. He remains a fan of the animated series. "You can love something and criticize it. I mean, I'm a Mets fan," he said, laughing. "When people criticize America, why do we assume that they hate it? I just want America to play better. I want 'The Simpsons' to play better."